A vacation in Hurghada would be awesome. You would be spending your time chilling on the amazing beaches, enjoying snorkeling and diving in one of the richest location around the world, or have magnificent fun in a jet ski, a banana boat, or a glass boat. While enjoying your holidays on the beaches of the Red Sea in Hurghada, never miss the chance to discover the secrets of the Pyramids of Giza. Day trips from Hurghada to the Pyramids would be an amazing experience you wouldn’t want to miss. This seems startling, right? Why don’t you add even more excitement to your trip and enjoy tours from Hurghada to the Pyramids of Giza? These trips are wonderfully organized and gives you the opportunity to explore the most popular monument in the world! Either by vehicles or by direct flights, it is always worth it to visit Cairo, the capital of Egypt and one of the most interesting cities in the entire globe. Arriving in Cairo, you would explore the Pyramids of Giza. Constructed around the 25th century BC, the pyramids served as the royal tombs of the kings of Egypt during the 4th dynasty of ancient Egypt. 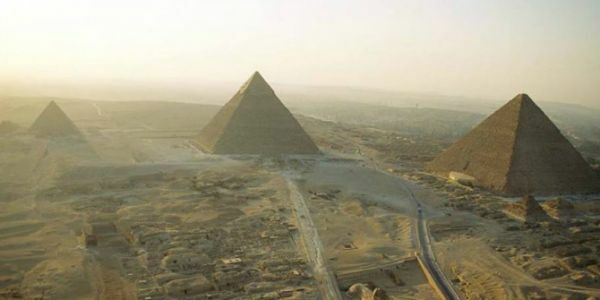 The construction of the Pyramids of Giza, especially the Great Pyramid of Cheops, is still a mystery until today. Establishing such huge structures with quite accurate measurements and in ancient times when there were no advanced technologies is quite breathtaking. There are three major pyramids in Giza, the Grand Pyramid of Cheops, the medium pyramid of Khafre, and the smallest Pyramid of Menkaure. Another monument you would regarding during your day trip from Hurghada to Giza Pyramids is the Sphinx. Constructed likely in the reign of Khafre, this huge stone carved statue of a lion with the head of a pharaoh, guarded the Pyramids of Giza for thousands of years. After enjoying your day trip from Hurghada to the Pyramids, you would have lunch in one wonderful restaurant. Afterwards, you have the option to explore more monuments in Cairo like the Egyptian Museum, Saladin Citadel, and Khan El Khalili.